One proposed solution to CO2 pollution is to collect the gas and sequester it away from the atmosphere. Nature has already done that for us in the form of vast reserves of coal. long lasting fixed carbon storage, at least a few thousand years, preferably millions. will not release carbon back into the atmosphere. compact: able to store vast amounts of carbon in a small volume. Amazingly, nature has already invented an ideal carbon sequestration substance: coal! proven geologically stable for at least 300 million years. unable to spontaneously convert to CO2 and escape into the atmosphere. 60-90% carbon by mass, a very high carbon density. no-cost sequestration: no energy is expended to leave it where it is! Owners of coal burning power plants continue to promote the idea that we can burn coal to extract its energy, then sequester the emitted carbon in a permanently stable repository. That proposal is the chemical equivalent of a perpetual motion machine. The energy stored in coal originally came from the sun. Early plants used the sun's energy to convert carbon dioxide to lignin-rich wood and bark. Physical processes buried the carbon and converted it through heat and pressure to coal. That process sequestered over 10,000 gigatons of carbon (with its embedded energy) throughout geological time, especially about 300 million years ago during the Carboniferous period. The removal of that carbon from the atmosphere contributed to cooling the Earth to our present agreeable temperature range. The reaction of coal with oxygen releases about 22.8 MJ/kg (19.6 million Btu per short ton, US EIA). To run this process in reverse and re-sequester the CO2 back into an ultra-stable chemically reduced form, such as coal (or maybe diamond), would require at least that much energy, and in practice much much more. 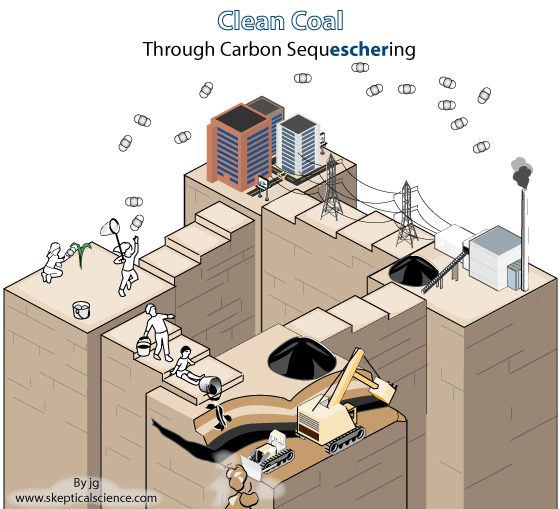 Any sequestration plan that doesn't consume more energy than the coal produces means storing carbon in a less fixed form. And indeed, all carbon sequestration schemes proposed put the carbon into less fixed forms than coal. Several proposals leave the CO2 as a gas or compress it to a liquid under high pressure without changing its chemical structure. These plans suggest storing the gas or liquid CO2 either (i) permanently underground, or (ii) in the deep ocean or in ocean sediments as CO2 hydrates. Alternately, solar energy in the form of photosynthesis is used to chemically fix the carbon as biomass. To remove the carbon from circulation the biomass must then be premanantly stored somehow. The most viable proposal is to convert the biomass into biochar. Of these, storage of CO2 in deep geological formations is considered to be the most technologically feasible (IEA). Since the carbon would be stored as CO2, not as fixed carbon, these reservoirs (and CO2 pipelines) will require continuous monitoring for leaks. Storage of CO2 as a liquid or hydrate in the deep ocean or ocean sediments is entirely unproven and has unknown long-term consequences (Vaughan, 2011, subscription required). Injection of CO2 directly into the ocean is not permanent as the carbon dioxide will slowly dissolve, contributing to ocean acidification, and ultimately re-entering the ocean-atmosphere carbon cycle. Carbon in biomass is chemically fixed, but is released again as CO2 when the biomass is burned or otherwise decomposed. Biochar is the most coal-like sequestration method yet proposed. In this method CO2 is converted to biomass by plants, then pyrolyzed (burned without oxygen) to capture about 50% of the carbon as charcoal (biochar) (Vaughan, 2011, subscr. required). Biochar is estimated to be stable for about 1000 years and could, with a major effort, perhaps decrease by 10% the impact of doubled atmospheric carbon dioxide (Vaughan, 2011, subscr. required). In the biochar sequence of coal-to-CO2-to-sequestered carbon, the energy to push some of the carbon back "uphill" to a fixed form comes from the sun by photosynthesis, but it's far from sufficient to close the circle. We can bypass the Escheresque carbon game entirely by collecting and using solar energy directly. None of the proposed methods stores carbon as safely and effectively as coal. Nature has already sequestered carbon for us. Let's leave it sequestered in those coal beds. Vaughan, N. E., & Lenton, T. M. (2011). A review of climate geoengineering proposals. Climatic Change, 1–46, doi: 10.1007/s10584-011-0027-7. http://www.springerlink.com/index/351246645074460L.pdf (subscription required). See also Lenton, T. M. & Vaughan, N. E. (2009). The radiative forcing potential of different climate geoengineering options. http://www.atmos-chem-phys-discuss.net/9/2559/2009/acpd-9-2559-2009-print.pdf.